Reach Your Potential. Fulfill God's Will. Change Your World. You are closer to Heaven than you think! Only five simple steps separate you from eternal joy with God in Heaven. Follow these steps to settle your eternal destination. 1. THINK ABOUT YOUR SOUL. When is the last time you considered the miracle of your existence? Why are you here? Why can you think, reason and feel far above the animal kingdom? Are you a temporary cosmic accident with no true purpose? Is there nothing beyond the mysterious veil of death? My friend, you have a lot to think about before you dismiss the afterlife and the eternal destination of your soul! The Bible teaches that you are a special creation of God. You are here because He wanted you to exist. He has given you an eternal soul that will live forever. Long after your body expires, you will still be, know, and feel. Your soul includes your personality and the part of you that is reading, understanding these words, and thinking about them right now. Most people will enter eternity without ever truly thinking about their soul beyond popular quotes, philosophical bullet points, or preconceived ideas. Take the time to learn what God says in the Bible about salvation before you wager your soul on anything else. 2. REALIZE THE PENALTY FOR SIN IS ETERNAL SEPARATION FROM GOD IN HELL. The Law of Consequence is evident in your everyday life. When any law is violated there is a penalty. Whether you rob a bank or jump off a bridge, consequences will follow. Our Creator not only instituted the laws of nature but also has given humanity a set of moral laws. The most basic of them are found in the Ten Commandments. Just as the laws of nature are in effect even if you don’t acknowledge them personally, so are God’s Laws. When we break God’s Law, it is called a sin. Sin separates us from God and condemns us to pay for our sin. Hell is the fiery eternal abode of those who die in their sin. God doesn’t want you to go to Hell. He made a way for you to go to Heaven when you die. 3. UNDERSTAND THAT JESUS CHRIST DIED ON THE CROSS TO PAY FOR YOUR SIN. If you owe money on your electric bill, the company doesn’t care who writes the check as long as your account is paid. You owe a debt of sin. The price is death in Hell. Jesus paid your sin debt on the Cross. When you accept His payment for your sin, your Heavenly account is marked “Paid in full” and your home is reserved in Heaven. When He arose on the third day, He proved that He was the Son of God and the Saviour of the world Who has power over death. 4. SEE YOUR NEED OF JESUS CHRIST AS YOUR PERSONAL SAVIOUR. You are a sinner who has broken God’s Law. The wrath of God abides on you every moment until you accept Christ’s payment for your sin. However, this Gospel tract in your hand is one more reminder that God is trying to get your attention. He loves you and wants you to spend eternity with Him in Heaven. Nevertheless, if you reject His love, you will face His fierce wrath. You have been warned! Don’t refuse His repeated attempts to prove His love for you and save you. Do you really want to meet God Almighty face to face after rejecting His Son’s sacrifice for you? 5. TRUST HIM IN YOUR HEART AS YOUR ONLY HOPE FOR HEAVEN. The Bible is clear that faith in Jesus Christ is God’s plan for your salvation. Good intentions and good works can never overcome your sin debt. When you die, God will not let you into Heaven because you were spiritual, religious, or attended a certain church. You must believe in your heart. Heart belief is more than a mental assent to the facts about the Lord Jesus. It is a personal confidence that Jesus Christ is exactly Who the Bible claims and that you are trusting Him with the eternal destiny of your soul. The Five Steps to Heaven are summed up in the word – TRUST. Take the final step right now! If you believe in your heart that Jesus Christ is the Son of God Who died on the Cross for your sin, you should confess your faith in Him right now and pray asking Him to be your Saviour. He will see your faith, hear your prayer, and reserve your home in Heaven. Dear JESUS, I confess that I am a sinner and cannot go to Heaven without You. I do not want to go to Hell. I believe that You are the Son of God Who died on the Cross to pay for my sin, that You were buried and rose again. Please forgive all my sin and take me to Heaven when I die. I am trusting You alone as my way to Heaven. Help me live for you. Amen. Contact me if you chose to trust Christ as Saviour today. I look forward to rejoicing with you! This Gospel presentation is available as a customized tri-fold tract here. I love input. I look forward to your comments. I reserve the right to delete comments that are offensive or off-topic. 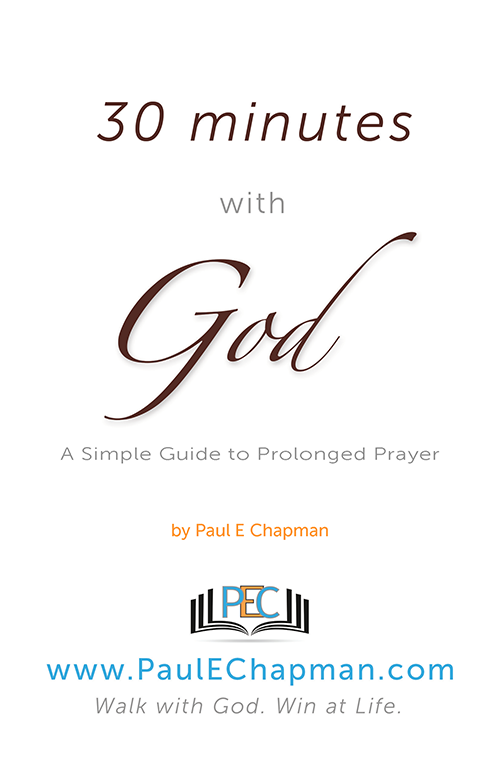 Subscribe today and receive our free prayer guide "30 Minutes with God". Get the Power to Conquer your Fears and Overcome your Obstacles by walking with God. We hate spam too. We will protect your information. Should I Tithe on My Tax Return? 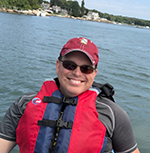 Livin' the dream in beautiful Southern Rhode Island. Learn my story on the ABOUT page. I pray that the content on this site has been a blessing to you! If so, I encourage you to like, share, email, retweet, and pin as much as you desire. Attribution for excerpts should include a clearly visible link to PaulEChapman.com. I love it when you share! Please keep in mind that all images and text on this site are the property of PaulEChapman.com. Please do not remove any watermarks, crop, or edit any of my images without first obtaining written permission. All free printables offered are for personal use only. Check attribution guidelines at PaulEChapman.com/permissions.